I keep repeating it from time to time, but it will do no harm if I do it again: I am a fan of the headphones. During the years I worked with them in the studio, and later at home, I got used to the specific audio environment they create, and I like it. Always when needed, while testing new devices, I listen to them with headphones, to eliminate the acoustics of the room and the background noise, masking small elements of the sound. I use various models of amplifiers and headphones on a daily basis, depending on the item tested. In general my reference point is a system composed of the Leben CS300 amplifier and the AKG K701 headphones, exchanged from time to time for the Ultrasone PROLine2500. 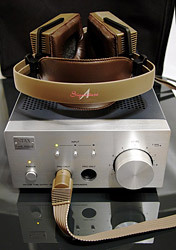 This is an incredibly pleasant, precise system, which is only bettered by the top STAX offering, composed of the SR-007 (Omega II) headphones and the SRM-717 amplifier (yes for me the transistor model gives better sound than the tube SRM-007t). Until recently this was the ultimate top. But after listening to AKG and Ultrasone Edition 9 (test in Audio) with the Cary CAD-300-SEI amplifier the electrostatic system had to recede place on the podium, not step down, but just make place for the mentioned dynamic system. Anyway, the Japanese company STAX proposed phenomenal systems. And one of the newest, quite friendly priced, is the presented SRS-4040 II. 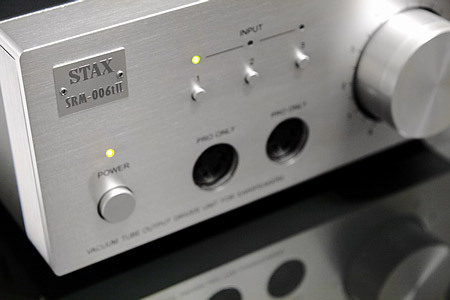 The STAX sound delicate and vivid. The common opinion about a cold, sharp sound of the electrostatics are exaggerated, or base on bad products. STAX are not part of those, and never were. The system 4040 II sound a bit darker than Leben with AKG. The sound stage is a bit further away, and the midrange is the main element in the sound. It is presented in a subtle and smooth way. When in the title song “California Dreaming” from the disc of Wes Montgomery (Verve/Universal Music [Japan], UCCU-9245, CD) strong brass instruments enter, with a clear tuba, the Japanese headphones slightly smoothen it. So it is not a very transparent sound of the top combination or Ultrasone PROLine2500, but it is incredibly pleasant, and allows to listen for really long time without tiredness. With disc containing such refined music and sounds, like the mentioned one, it is not hard to achieve. But also the strongly “tuned” material from the EP Panik Manifesto – Diary of Dreams (Accesion Records, EFA 23452, CD) with electronic, sampled music, was shown in an attractive, involving way. However, when we turn up the volume on such music, then the clipping of the digital signal, compression and similar will be shown as brightening of the upper midrange, as if the electrostatics would get a slight peak there, shown without prejudice. With music of Jarre from the disc Geometry of Love (Project by Jarre, AERO Productions/Warner Music, 60693, CD) the mentioned distortions manifested themselves much weaker and even loud listening did not translate in lowering the pleasure coming from music. The system fed directly from the balanced output of the Prime turned out to be a bit too hard. It was different when the source was exchanged to the DAC/preamplifier Manley Wave. The resolution was a bit lower, but the tonal balance was better. In the sequence opening Jarre's disc the sound of the sea is simulated by squeezed aluminum foil. The Cary and AKG system showed it ideally, AKG with the Leben not as unequivocal, and the STAX showed it much milder, allowing to guess the sound source, but suggesting it can be the real sea, showing it as a natural sound source. The Japanese system allowed for enjoying the music without being distracted by its details, as if the effect would be more important and not the intention. Interesting enough in this system the Wireworld Gold Eclipse 5² cables sounded better than the Velum NF-G SE Blues. The timbre is splendid in the STAX. This is the fortè of this combination. Also the brass, mainly due to the very good resolution, are phenomenal. Due to that “The Songs From The Hills” from the album Unit of Adam Makowicz (Polskie Nagrania, PNCD 935, Polish Jazz vol.35, CD) sounded fresh, in an open and natural way. The system handles old recordings very well, like those from the disc Swing is The Thing from Mills Brothers (History 20.3039-Hi, 2CD), where recordings from the 30. had an incredibly full, nice and integral sound. For such kind of music ideal tonal balance is a prerequisite. And even when with modern music, depending on the disc, different elements were accented, here one could hear how well balanced the system is. There was not even a hint of brightening, thinning, and the depth of the sound was incredible. Most probably the good resolution and the quite delicate way of sounding helped. All discs from that era I listened to sounded that way. So even if in absolute terms we deal with a slightly warmed than usual sound, we have to be careful choosing the accompanying hardware and cables, as the midrange can easily be hardened. And I do not recommend that. 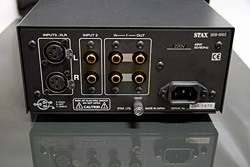 The new series of products presented by the Japanese company STAX is different than the previous ones. The most important change is not the insides, but the change of the color of the front panel – traditionally golden, putting the STAX in one row with other Japanese giants – Accuphase, C.E.C., Luxman, Leben, where the golden front panels are a symbol of them being of Japanese origin. Times change, or better said, the American market, the largest market in the world, is changing and most visibly forced different configurations, as earlier C.E.C. And now STAX changed the color of their fronts to silver. If Accuphase will do it I will shave off my beard! So, the aluminum front panel is silver colored. On the right hand side we have a large volume control knob, in the shape of two coaxially placed elements – the middle one controls the level of the left channel, and the sleeve – the right channel. This is a very simple and handy solution, allowing to eliminate the balance potentiometer from the signal path, that often degrades the sound (especially channel cross-talk) while keeping the functionality. Left to the know we have three small buttons with green LEDs to select the input and below them two headphone sockets – both in the “Pro” system – and a mechanical power switch with an orange LED. The device looks very elegant, and the user is strengthened in the belief he or she is dealing with a serious device by it's significant depth. On the top cover many round cut-offs were made, and in the middle it is slightly bulged, to underline that the heart of this device operates on tubes. The back plate is quite interesting, as we have three inputs – two unbalanced, with gold plated RCA sockets (one with an output – pass through) and one balanced with gold plated, solid Neutrik XLR sockets. The input selector is based on sealed relays with gold plated connectors, soldered to a small PCB near the XLRs, soldered to the same PCB. From other inputs short, shielded cables lead to the mentioned PCB. No 1 input is closest to the power supply transformer, which, however nicely shielded with copper tape and permalloy plates, will surely have an influence on the signal transferred there. Besides the pass-through always influences the sound in a bad way. Setting priorities the best input is number 3 (XLR) as the device is fully balanced, then RCA #2 and #1 in the end. 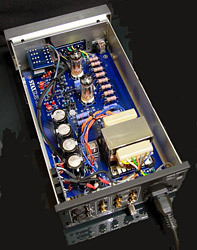 amplifier SRM-323II. Three voltages come out of it – two, separate for each amplifying channel and the third for the polarizing voltage for the headphones. Why only one voltage to the power stage? 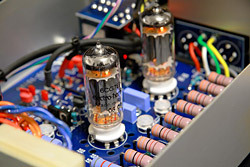 It seems that the tubes are fed with high voltage – four large Elna capacitors do testify about that. It means that the drivers and glowing are supplied with the same voltage. The mentioned tubes are the 6CG7EH from Electro-Harmonics – double triodes with medium mu. Due to the parallel connection of their outputs in each channel, their output impedance was minimized. 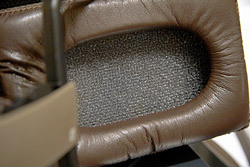 In the headphones a new, extremely thin membrane was applied, only 1.35 micron thick. This unique diaphragm could be made only using new materials with molecular structure not available before. The model SR-404 is equipped with a broad, flat PC-OCC multi solid core low capacitance cable.